The breed takes its name from ancient market town of Clun, situated in the beautiful Clun Valley in the south-west corner of Shropshire and near the county of Powys. The Clun Forest is a mountainous district, running to an altitude of 1,630 feet above sea level. It is a natural sheep walk with signs of “Pounds” and “Druid Circles” still remaining. Offa’s Dyke runs through the lower part of the Clun Forest. It has been suggested that the original Clun sheep were bred by the pastoral or semi-nomadic shepherds who lived in the Forest about a thousand years ago. 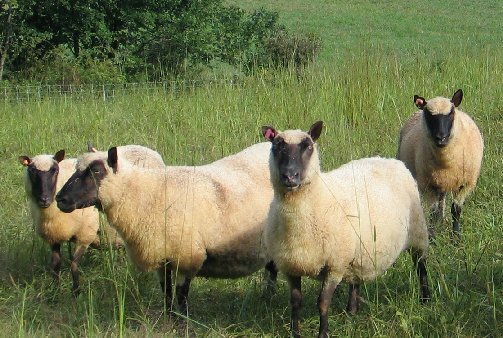 The contented nature of the breed is a valuable asset, for the Clun is a good forager and will range over large pastures without attention. It is at home on the hills or moorlands and will fend for itself like a mountain breed. The Clun Forest Sheep Breeders Society was founded in 1925 with the object to ‘secure in the future, absolute purity of lineage and fixity of type, also to get this grand breed of sheep still more widely known and recognised among the leading breeds of the United Kingdom.’ This was stated in the first Flock Book, published in the year 1925. A Flock Book has been published every year since.